The second call for proposals for the Next Generation Program has yielded in 11 proposals of which eventually 4 have been selected for funding. The Skoltech – MIT Joint Next Generation Program (NGP) covers the whole range of academic and institution development activities. That includes research, education, innovation and academic services towards establishing and promoting a mutually beneficial long-term bilateral collaboration between Skoltech and MIT, as well as further development of Skoltech work streams. Skoltech is happy to announce the results of the first call for proposals within Next Generation Program: Skoltech – MIT Joint Projects. The “Next Generation Program: Skoltech – MIT Joint Projects” (NGP) represents one of the new formats of Skoltech-MIT collaboration and covers the whole range of academic and institution development activities. NGP seeks to establish and promote a mutually beneficial long-term bilateral collaboration in research, education and innovation between Skoltech faculty members and their MIT counterparts through the research-driven projects, as well as further development of Skoltech work streams within its development programs. During the 2015 Call for Proposals a total of 29 White Papers were submitted resulting in 25 Full Proposals. A panel of external reviewers consisting of nearly 80 experts, including a diverse mix of international reviewers from USA, and Europe, and others from Israel, Australia, and Singapore carefully evaluated the pool of 23 full proposals for research-driven projects according to NGP evaluation criteria. In addition, the Steering Committee considered these peer reviews and also evaluated all of the proposals with regard to internal selection criteria and implemented an US National Science Foundation -style selection procedure – two internal reviewers presented each proposal and the Committee assessed them in a series of meetings. The feedback from peer review was communicated to Project Leaders confidentially. We congratulate the project leaders of selected proposals. For those who were not selected we encourage them to resubmit their revised proposals for the anticipated 2017 call for proposals within NGP. Skoltech has never had an internal competition of this scale and diversity. It clearly showed mutual interest and eagerness for collaboration in Skoltech and MIT faculty communities and sent a clear message on Skoltech research strengths, priorities and openness to our peers all over the world. 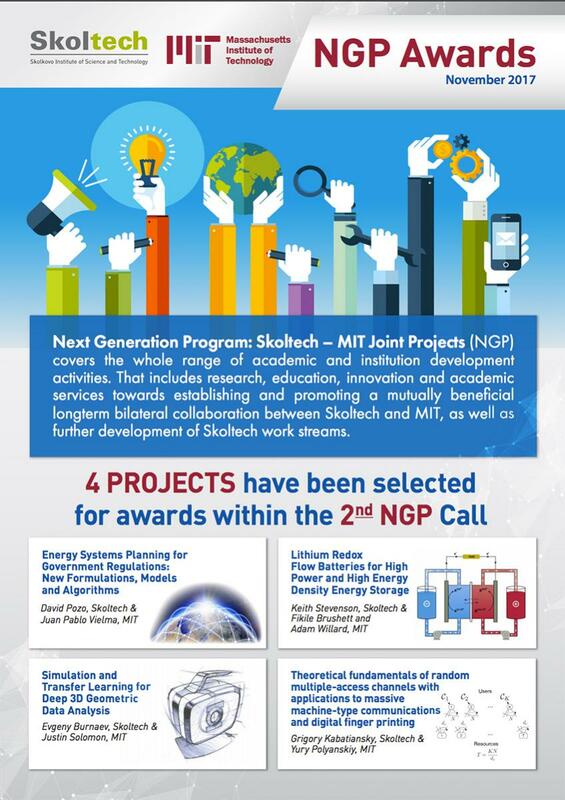 Skoltech thanks all participants and organizers of the first NGP Call for Proposals.